The house is a pole house set high off the ground so you look into the tree tops from the deck that runs along the front of the house. The house is two storied with an open plan design so has a spacious feel. There is a 1 minute walk up the hill from the road through native bush. There are nice views down to the beach. You can really unwind here and relax in this quiet setting. Reading or relaxing on the deck in the treetops is great for getting into 'Barrier time' (slow).Stay at home and cook, or go for a walk and see whats on offer at the great cafe down the road. If you want to meet some locals and have a drink then it's not far to walk to the Irish bar down the road.The house is comfortable and furnished with all you need for a holiday.The location in a more populated area of the island means you can stay there without having transport, to get to places you need on a holiday. It is easy enough to hire a car if you want to explore the island further. The house uses alternative power, as does all of Great Barrier Island. Solar power provides electricity for lights and appliances in the house. The power is 240 volt in the house, so all normal appliances can be plugged in and used. It is not possible to run heating appliances like hair dryers or hair straighteners etc, as it is too much of a tax on the power that is stored in the solar batteries. There is a gas heater, a gas caliphant for hot water and gas cooking. Limit of four people.The bach is good for a couple.There is a 3 minute walk through the bush uphill to the house and then up some stairs to the house.Not hard but, definitely can't drive to the door. This is a cute little house that was fine but could use some updating. The deck is old, and the inside areas could use some new paint and/or coverings. Only the king size bed in the master bedroom was comfortable. The single beds in the other two areas were very old and saggy. Probably fine for kids, but would be uncomfortable for an adult. 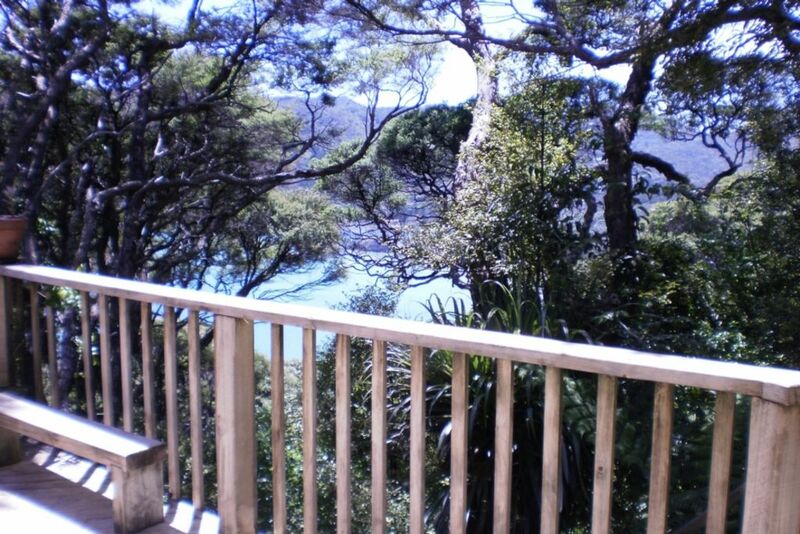 The location is very private with both decks having a great view of the bay. It is essential that you buy/bring drinking water because the water draining from the roof catchments did not look safe to drink. The trail from the road to the house is steep and uneven, and not recommended unless you are in good shape. Bring a flashlight or headlamp if you plan on staying out after dark. Very informative and friendly booking experience. Clean and tidy bach, very quiet and relaxing. Fantastic location, only a short walk from the beach, the store and the pub. The path up to the house is not too bad, as long as you are not carrying a whole lot of gear. The house itself is private, rustic and full of character with basic amenities, all you need for a relaxing stay. Definitely would love to come back.